Above: Craig Martin, at home in the Jémez Mountains. ON MAY 10, 2000, high winds exploded through a prescribed burn in the Jémez Mountains. For weeks, flames thrashed across Bandelier National Monument, Santa Clara and San Ildefonso pueblos, Los Alamos National Laboratory, and the lab’s tidy neighborhoods. It leapt from the crowns of old-growth ponderosa pines and wolfed the choked undergrowth of grasses and shrubs. Hundreds of Los Alamos families lost everything. Even those who still had four walls and a green lawn could only stare dumbly, helplessly, at the charred remains of 47,000 acres, once the bucolic backdrop to their lives. Martin drew a line in the debris. He would stay in Los Alamos if he could figure out how to heal the landscape and ease the fire-induced trauma of his friends and neighbors. And maybe, he thought, that effort would kindle a bond between those of us who sometimes venture into nature and all the flowers, grasses, trees, birds, butterflies, reptiles, and animals that cannot live without it. IN 1987, the only line Martin drew was this: He would happily serve as stay-at-home dad for their daughter if his wife, June, pursued a hydrology career in a place near decent trout streams. She picked Los Alamos National Laboratory, and he got his mountain waters. Somewhere among the 30 days a summer he spent casting a line, he and June had a second child. Dad and the kids fell in with a group of moms, and he organized parent-child hikes for all of them. It’s easy to do in Los Alamos, the onetime secret city north of Santa Fe. Some trails ramble right through the center of town. Others start where the houses end. Schooled in plant ecology, Martin learned about local wildflowers and shared his knowledge with young and old. Like happy ducklings, they toddled behind his elfin energy and wiry frame, keeping an eye out for their guide’s short, unruly ponytail and ever-present ball cap. Wander a trail with him and you’ll soon hear him call roll. Field chrysanthemum. Scarlet gilia. Fetid goosefoot. On a recent hike, he pulled two spent blossoms, turned them over, and used the undersides as a teaching tool for discerning an aster from the nearly identical fleabane. Early on, Martin reached out to an elderly resident who had lost her home, but not her love for the trees she once saw from it. “Granny was 75 then, and we had a special planting where she put the tree in the ground,” he says. “Her family came back and watered it every day.” Today, that pine, near the Mitchell Trailhead on the northwest edge of town, is commonly known as “Granny’s Tree.” Still young, it stands taller and wider than Martin. Sweeping up the foothill beyond it, more trees thrive, along with scrub oaks and wildflowers, nestled amid fallen trunks and skeletal snags—important reminders of all that cannot be recovered. She did. Now director of the Los Alamos Teen Center, she oversees that same YCC program, which still builds and maintains trails. Even after what Martin calls “the Herculean time,” those first years of whisking himself and others all over the afterburn with their seedlings and seed balls, favorite trails remained off-limits. He figured their rescue was too difficult and bound to fail. “They’re gone,” he said at the time. But in 2004, he asked June what she wanted for her birthday. “I want to hike the Water Canyon Trail,” she said. He pulled together a crew. It took a year, but June got her favorite trail back. Six years later, another fire, Las Conchas, ripped through three times the acreage of Cerro Grande, coming dangerously close to the major tree-restoration area, and destroying the Water Canyon Trail. Once again, Martin rallied his trusty trail rats. “I think I’ve tackled every mile between here and the rim of the Valles Caldera, some of them twice,” he says. In 2001, the Points of Light Foundation named Martin its national volunteer of the year. In 2012, Los Alamos County declared him a Living Treasure. Earlier this year, the Santa Fe National Forest awarded him the agency’s Golden Pulaski Award for decades of service, and Los Alamos County councilors declared January 11 Craig Martin Day. Mention his name to pretty much anyone in town and you’ll hear even more praise. “You can’t possibly say enough good things about Craig,” Hogan says. June fills a scrapbook with his accolades, but Martin is almost too busy to notice. 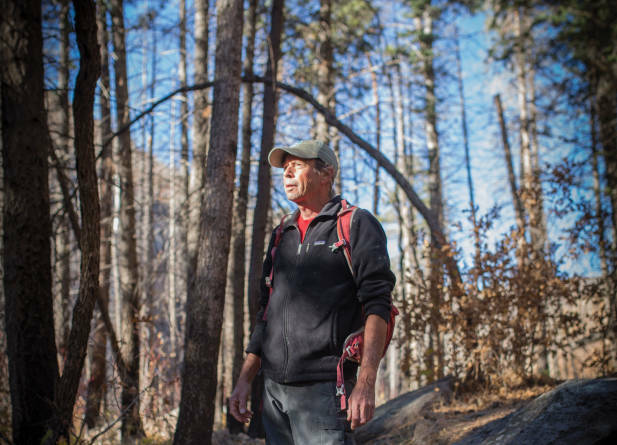 Officially, he’s retired, but he admits, “I’m not very good at that.” He’s midway through co-authoring a three-volume set of books about plants in the Jémez Mountains. His combo has logged time in a sound studio for a potential CD. He dreams of building a trail that loops hikers from the highest outpost to the nearest brewpub. His fishing gear has gone too long unused, and, frankly, he’d rather go hiking than accept another award. That’s where his heart beats best: out on the trail, in a pair of boots so well worn that the tread is gone. Robert Oppenheimer picked Los Alamos for the nation’s super-secret atomic bomb project in part because he held happy boyhood memories of rambling in its forested hills. The opportunity to combine science careers with a love for the outdoors still draws residents, who started dreaming up a nature center 17 years ago. After piecemeal attempts at programs in local schools, the Pajarito Environmental Education Center officially opened its doors in 2015. Inside, the PEEC boasts a planetar-um, hands-on learning stations with snakes, tarantulas, and lizards, an exhibit area, a wildlife-watching room overlooking Acid Canyon, and a shop with every guidebook you’d ever need around here, plus works by local artists. Outside, nature trails explore both native and xeric landscapes, logs and sticks invite kids to build towering forts, and a retired labbie’s success at collecting and hybridizing penstemons will soon erupt. “We’ll have 65 to 70 varieties, with more than 1,000 plants—reds, blues, purples, white, bicolors, a few yellows,” says Larry Deaven, who once worked on the Human Genome Project. PEEC’s ambitious programming schedule, which won a 2016 Governor’s Award for Environmental Excellence, includes star parties, wildlife lectures, guided hikes, yoga classes, and what director Katherine Watson likes to call “Craig Martin in a box.” The local trails hero helped develop the Los Alamos Trails app (nmmag.us/LATrails), a free download that details some 50 miles of adventures with caves, petroglyphs, wildflowers, and wild animals.